BLAIRSVILLE, Ga. – In his wastewater treatment plant report, Supervisor Jody Cook told the Blairsville City Council at their Tuesday, Feb. 6, meeting that recent testing has found an increased level of chemical pollutants flowing into the city’s wastewater facility. Cook reported to city officials that it was determined that the chemicals were coming from the Aviagen Hatchery, a poultry hatchery facility located near Colwell Detention Center, after increases in the chemical oxygen demand (COD) at the treatment plant were discovered in January. Mayor Jim Conley explained changes in Aviagen’s clean up process after delivering boxes of chicks to clients have resulted in the increased amount of chemicals coming into the wastewater plant. In follow-up interview with Cook on Thursday, he stated unknown chemicals were being outside of the hatchery facility during the hatchery’s clean up process. Cook also said that the hatchery has been contacted about the issue and changes at the hatchery concerning its clean up process were being made, including the installation of a sewer drain. Cook also confirmed Mayor Conley’s comments from the meeting stating that the pollution poses no health risk but puts a strain on the treatment facility. Other department reports featured Darren Harper, supervisor of the Downtown Development Authority (DDA), telling of the DDA’s plans to install a lit bulletin board near the downtown square. Harper described the bulletin board as “a place where people could see what events are coming up, a directory of businesses in the downtown area, (and) things of that nature.” Harper stated the cost of the board would be just under $500 and the proposed location would be between King’s Five and Dime and Hole in the Wall. 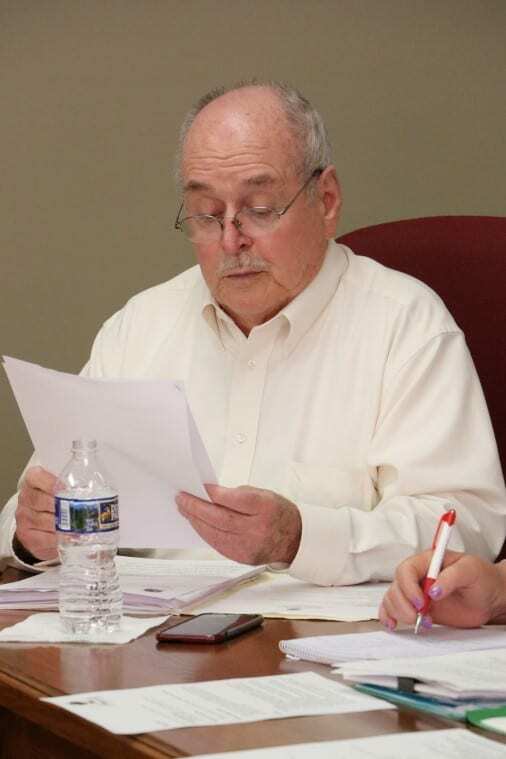 During Harper’s report, the council unanimously approved a move to replace DDA member Bob Head with former member Robert Rogers and move Head’s membership to an honorary status with the DDA. In the water treatment plant report, Supervisor Danny Dillard stated increased water demand has resulted in ground water wells not producing as much as in the past, and he added that adjustments would be made at the plant wells to account for the increased demand. During Hamler’s report, the council unanimously approved the hiring of Edgar Marshall as airport operator. 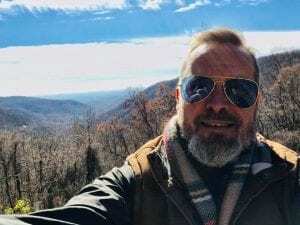 Marshall, who worked previously at the Western Carolina Regional Airport near Andrews, North Carolina, for five years, will replace current operator Storman Glass, who will be leaving Blairsville Airport at the end of May. “I’m excited about getting started,” Marshall said after the council’s approval. The council also discussed the upcoming merger of Rite-Aid with Walgreen’s. A representative from Walgreen’s explained the recent merger of the stores to the council, and the council approved an alcohol license application for Walgreen’s managing agent Evia Kirkland. In addition to this, the council also approved the occupational tax certificate for Walgreen’s. A complaint concerning the city’s inability to accept credit or debit card payments from water customers was addressed by the council. It was explained that the Notla Water Authority currently charges a 3 percent fee for credit or debit card transactions. After further discussion, the council approved for preliminary steps to be taken to establish a method to receive card transactions for water payment. “I just think, personally, it’s high time we did that,” Council Member Rhonda Mahan said. 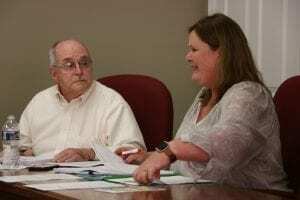 Later in the meeting, the council approved the Rushton and Company accounting firm from Gainesville, Georgia, to perform the city’s 2017 financial audit. The council also accepted occupational tax certificate and sign permit applications from Cousins’ Cuisine LLC (dba Sammies Sub Shop), Farmers Daughters Etc., Waves for Weight Loss, Inc. (dba Smoothies & Supplements), and John E. Mahan, Attorney at Law. 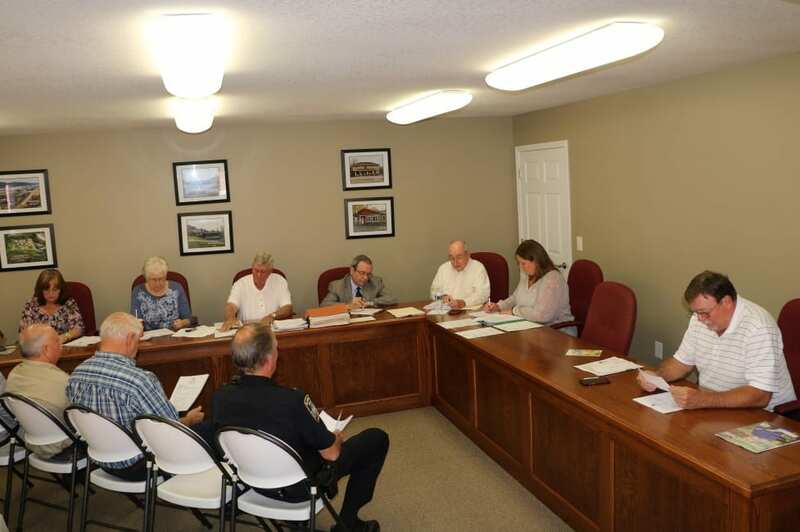 Blairsville, GA – The Blairsville City Council convened on May 9, 2017 at 6 p.m. for their regular May Meeting. The May Meeting had been postponed the previous week because of the passing of Council Member Martha Cone. Pastor Marty Duncan gave the invocation and Police Chief Johnny Carroll led the Pledge. Mayor Jim Conley, City Attorney David Barrett, City Clerk Kaye McCann and all Council Members were present, with the exception of Councilwoman Martha Cone. Conley asked for a Moment of Silence to honor Ms. Cone at the beginning of the Meeting. Her absence was nearly tangible as everyone in the room stood with heads bowed. Later, after some discussion on balloting, the Council agreed to wait until the November election for voters to select a replacement for the vacancy left by the passing of Ms. Cone. Mark Jarrett of the Union County Environmental Health Department (UCEHD) sent a letter to the City of Blairsville, said Conley, and requested that they direct the City to allow the UCEHD to enforce a law that is already in existence. The letter stated: “Under Georgia Law O.C.G.A. 26-2-391, a county or municipality is authorized to issue permits for the operation of non-profit food service at events that last 120 hours or less if sponsored by the county, municipality or a non-profit organization. The law specifies the food safety standards that must be met to protect the public’s health. The county or municipality may delegate the authority to issue such permits to the County Board of Health.” This means that food vendors engaged for a non-profit event in Blairsville would be required to undergo an inspection by the UCEHD (at no charge) to get permitted. The Council unanimously approved a motion to allow UCEHD to enforce this law. UCEHD is a separate entity from Union County Health Department. Conley recited a Proclamation that the week of May 7 – 13, 2017 be named Municipal Clerk’s Week. The Proclamation was warmly received by McCann, who said she appreciated the opportunity to serve the Council, the Mayor and the City of Blairsville. Conley recited Resolution R2017-03 adopting the 2017 Comprehensive Plan for Union County and the City of Blairsville as of May 9, 2017. This is something that the Georgia Department of Community Affairs (DCA) requires every year, said Conley. The Resolution was approved. An Agreement between the City of Blairsville and Notla Water Authority was signed by all Members of the Council. The Agreement is to accommodate the City of Blairsville in furnishing water and sewer to a commercial property on Pat Haralson Dr. 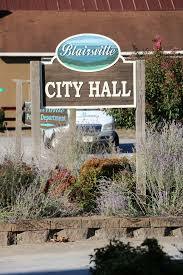 The Agreement sets the rate the City of Blairsville will pay Notla Water Authority for the water they will supply. Conley recited Resolution R2017-02 to adopt an amended Alcohol License Fee Schedule, which, as was addressed in last month’s Council Meeting, will align with the Union County License Fee Schedule. A motion for the adoption of this Resolution was unanimously approved by the Council. • A motion to accept the Georgia Department of Transportation (GDOT) Contract AP017-9031-33(291) Union for avigation and land acquisition service and obstruction removal design for the Blairsville Airport. • A request by the Youngstown Baptist Church for sewer service to their new location on Par Haralson Dr. It would involve running a two inch graywater sewer line to a location on City property. Water would be provided under the Agreement with Notla Water Authority approved earlier in the Meeting. • Tentative approval of Payroll Direct Deposit contingent upon the amount of fees charged to the City of Blairsville for this service. • Police Chief Johnny Carroll reported there were a total of 129 calls logged in April, a total of 5426 patrol miles driven in April and a total of 391 calls logged year-to-date. The majority of those calls were Courtesy Escorts, Funeral Escorts, Miscellaneous Traffic calls and Warrants served. Carroll received approval from the Council to hire Andrew Glass for the position of Part-time Police Officer at the rate of $14/Hr. • City Water Department Head Ottis Franklin reported nothing out of the ordinary; routine maintenance. He said that 53 of 73 water meters had been set at the new subsidized housing complex behind Butternut Creek Shopping Center. • Water Treatment Plant Superintendent Larry Stephens reported that they were going to clean out the raw water intakes and that bids were coming in to replace the valve actuators. He said the auto dialer and the ACT-PAC, both of which were hit by lightning would be replaced very soon. • Downtown Development Authority Head Darren Harper reported that he would be attending a training class next week at Lake Lanier Islands. He said the next DDA Board Meeting will be Tuesday, June 13. He said they have been heavily promoting the upcoming Arts and Crafts Festival that will take place on Memorial Day Weekend; he said as of this Meeting, there were 59 vendors signed up and he expects to have about 68 by the kickoff of the event. Harper said there is an offer for a section of the Haralson property across from the Foodland store. He said three businesses are scheduled to open this month and he observed that the old cinema across from City Hall has been leased. Movie Night and Concert on the Square, he said, will begin in June. • Wastewater Treatment Plant Superintendent Jody Cook reported that an actuator that regulates discharge into a creek needs to be repaired, but in order to do that they are going to have to purchase a new one because they cannot operate while the broken equipment is sent off for repair. He said the cost will be about $3,800, but they will then have a spare so this won’t happen again. He said, also, that there is a relief flow pipe that has corroded and needs to be replaced for a second time. He said they are going to use stainless steel pipe this time so it won’t corrode so easily again. 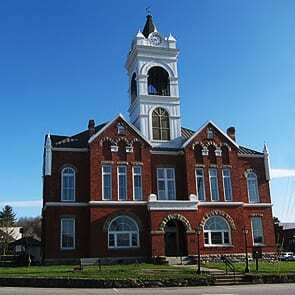 Cook requested that the Council address the Goforth Williamson Inc. (GWI) three-year maintenance contract. It was unanimously approved. • Airport Manager John Hamler reported that the previous week had been busy with five jets and two (Beechcraft) King Airs using the facility along with seven car rentals. He said they had sold out of Jet “A” fuel from April 3 – April 30. He said the grounds and building maintenance was keeping them busy. He said that a sign at the new entrance should be considered by the Council that would be in compliance with GADOT. He said there are now 26 names on the hangar waiting list. David Brown Transportation will be taking over maintenance of the AWOS system. Hamler said that every fuel or oil sale at the Terminal is taxed through the Terminal POS system. With no Executive Session called for and no further business to conduct, the Meeting was adjourned.